Netbooks are all so similar in terms of performance that it’s difficult to get excited about reviewing “yet another netbook”. Aesthetics and build quality may change, but outside of features like NG-ION or the use of an SSD, there’s not much new under the sun. However, one Atom variant that we haven’t had a chance to actually test in house is the dual-core Atom N550. With support for DDR3 memory and a second Hyper-Threaded core, can this “high-end” Atom change our feelings? If you read our ASUS 1215N review, you probably already know the answer, but it’s always good to get concrete numbers. Besides being our first look at a dual-core Atom N550 netbook, HP’s Mini 5103 packs in just about every other extra you can imagine. The test unit includes a multi-touch 1366x768 display, 2GB DDR3, Bluetooth, Gigabit Ethernet, and a Broadcom Crystal HD decoder—just in case you want to watch a 1080p H.264 movie on your 10.1” LCD. 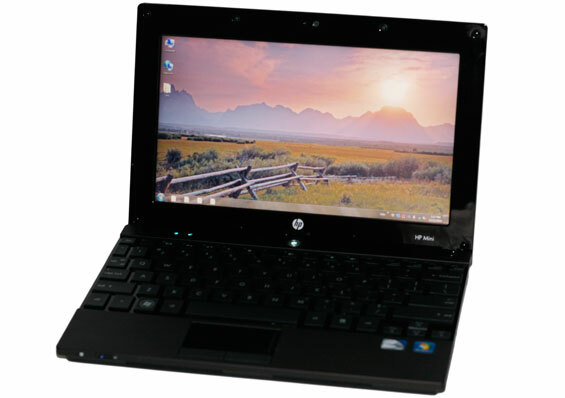 As with the Mini 5102, the 5103 is also one of the best looking and well-built netbooks to hit our labs. Unfortunately, the pricing puts it into the realm of much faster ultraportables, but if you want the combination of features HP provides—and your company is willing to foot the bill—it’s a decent little machine. Outside of the change to the CPU and memory, about the only other noteworthy update compared to the older 5102 is the move to an espresso (dark brown) finish. HP informs us that this was done in response to customer feedback, and the espresso color doesn’t show fingerprints quite as much as the old black. We do have to point out a few items on our test system that we could no longer find on the HP site. First, our netbook shipped with Windows 7 Professional as opposed to Starter or Home Premium. Second, it has a 768p multi-touch LCD, while we could only find a 1024x600 multi-touch option online now. Breaking down the upgrades: $40 moves you up to Win7 Home Premium (and Professional would cost even more! ), and you also need $25 for the 2GB RAM upgrade (not available with Win7 Starter); add $25 for a 768p LCD, and an additional $25 to go to 600p with capacitive multi-touch; the CrystalHD decoder is a big add-on at $45, and Bluetooth is another $18; finally, the N550 model costs $20 more than the N455 version. Put it all together and you basically get what you pay for—provided you think the starting price is acceptable. As a point of reference, the ASUS Eee 1015PEM-MU17 starts at around $340 online, with an Atom N550 and 1GB, but it lacks Bluetooth, Gigabit Ethernet, and several other features on the HP. Barring any other discounts, you’re looking at a nearly $200 premium to move to the 5103. As a parting shot on pricing, you can also find pre-configured HP Mini 5103 netbooks from a variety of resellers; the cheapest starts at $384, and it looks like Atom N550 would only bump the price up around $40. Unfortunately, no one appears to offer any pre-configured N550 models, so you have to go straight to the source. We’ve heard comments in the past that suggest you can get substantially better pricing on the configurable models if you call HP (one reader claimed a 28% discount on an EliteBook), so if you’re in the market for this type of netbook it can’t hurt to call; $500 would be far more impressive than the current $700 price tag. Can I ask a question? Something I always wondered at Anandtech. When I flip from page to page in this review, the machines being compared in the charts are never the same. For example: The Macbook Pro is not included in the battery life charts but it's in the performance charts and display charts. But it's also never mentioned why the items in the charts vary from page to page.. I have noticed this in other articles as well. My first thought is that it would 1) skew the results too much to make the graph unreadable, or 2) the data is not available. But a more nefarious reason would be to cherry pick competitors to make the graph say what you want it to say. The simple explanation for data missing from various reviews is that we either didn't have it, or we didn't choose to include it in a particular review for one reason or another. For laptops, if we've reviewed a laptop in the past, the usual reason it's not included is simply to avoid bloating the graphs. We have an "unofficial" decision to try to keep graphs to around 10 items to make them readable (at least for laptops). So, as we review new laptops we sort of arbitrarily remove older units from the charts. I try to keep relevant items in the charts, though, which is why the 5102 is there, along with single-core CULV, dual-core CULV, the i3-330UM UL80Jt, 1215N, 1001P, etc. -- basically one each (at least) of the various platforms. As for how the charts are created, I do need to take some time at some point to make things easier. Right now, we use spreadsheets with results for the various laptops. I have netbook, entry, midrange, and high-end spreadsheets floating around -- multiple revisions of each. Vivek and Dustin have the same thing. So when it's time for a new article, I need to try to collate results from two or three spreadsheets, then add in the results for the test laptop. It's a bit of a pain, and that's why Vivek and Dustin often include different laptops in their reviews. I think this netbook has the right idea w/ features. I also think it's $200 more than what it's base and configured prices should be. I wonder if there would still be a profit if they knocked $200 off the price. "just in case you want to watch a 1080p H.264 movie on your 10.1” LCD"
I agree with this statement. While I don't have a problem with 1080p, I'm not sure why it's being pushed so hard. 720p is still acceptable, especially given the price differential as you mentioned. While I somewhat understand the nature of the dimensions (small device + wide keyboard + 1080p for HD video), I still do not completely understand why this is the majority decision. I'd love to see 768 vertical pixels become available on more netbooks, but if you can buy 3 other netbooks for the price of this one, a vendor has forgotten the definition of the word netbook. Don't blame the dual-core CPU for inflating the price, the 1K unit price of the N550 is $22 more than N455. On another note, why are there exactly zero SoC Atom's in Bench? Also, why do you generally not include mobile CPU's in Bench? I mean, what are 10 flavors of Athlon II X2 good for with no numbers for e.g. K625 ?